How’s that for a quick turnaround, eh? My second Blood Angels Deimos Rhino in as many weeks! Done, and looking dusty in record time, I now have to try and make this blog post interesting seeing as I just wrote a post about a very similar tank last week. Let’s see how that goes. As with the last post, I can say that the kit looks great, and is a little tricky to assemble if you don’t read the instructions. It is a joy to look at when finished though, and while the GW variant is a classic, this Forge World version just looks so cool. Classic styling with modern design aesthetics – very nice. So, yeah, it’s the front of a rhino again. 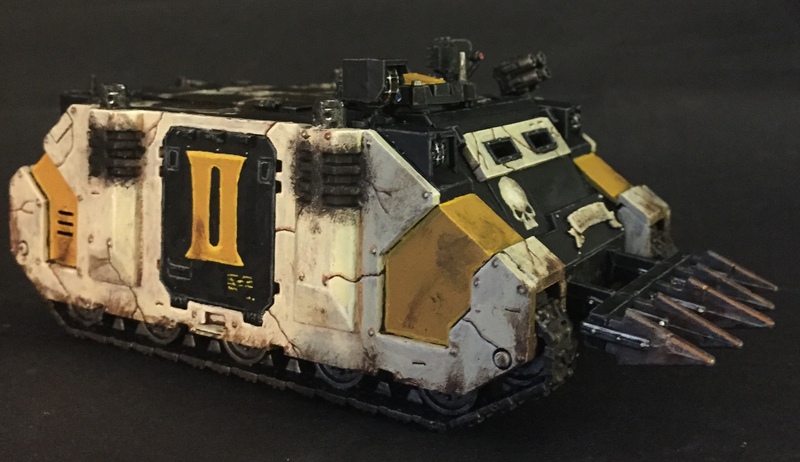 I suppose the weathering is a little different, and the missing paint on the white stripe is also a little different… yeah, it’s a little different. Oh, yes, and there isn’t a flamer on this one. I almost forgot that. 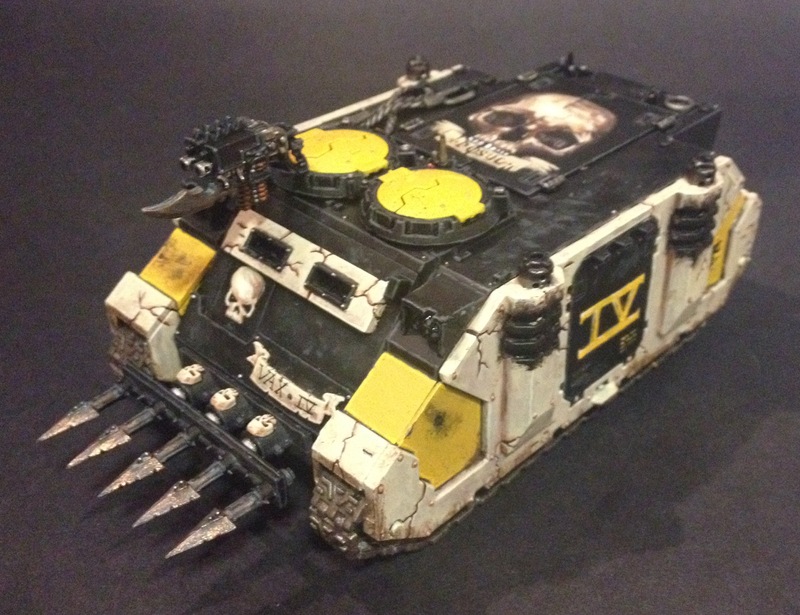 This tank sticks to the combi bolters. This was done because I thought it was only right because one ought to have a pure, basic variant. Also, Forge World doesn’t give you enough hatches in the pintle mounted weapons set to allow you to do too many of these – the one minor drawback of a great little upgrade kit. 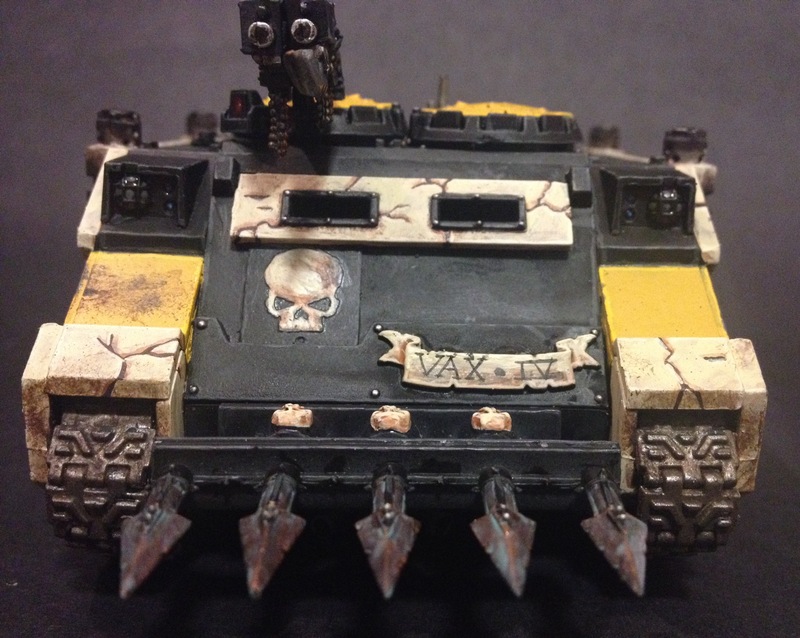 The weathering was fun to do, again. Beaten up brushes, sponges, blacks, greys and Typhus Corrosion in generous but subtle amounts. Also, again I’d like to give a shout out to Mephiston Red spray – such a wonderful product. Were I to do it again though, I might not cover the silver parts with it. A bit of masking tape might mean a single coat of silver rather than a couple. I could knock these out even faster! 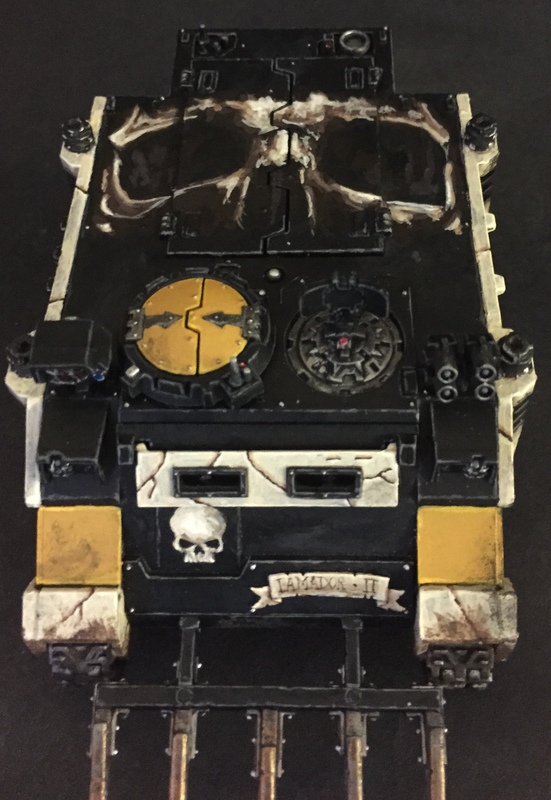 And (again – sorry about all the repetition) there are some tactical arrows on the roof to go along with the unit that will be riding around in this thing. And, that’s about it. For all other details, rather than repeat myself, please see the post about the first rhino from last week. But, as a treat, here are a couple of snaps of both APCs together. That’s me done with Rhinos for a little while at least. Bigger fish to fry. Well, one bigger fish anyway. That has taken up a lot of liquid green stuff – but more about that later. In the meantime, I hope you’re enjoying the Gathering Storm as much as I am (you have no idea how much I want to talk about it but I’m going to wait so as to not give away spoilers). Lots to look forward to there. More on that, and my Blood Angels in the upcoming posts. Onwards! 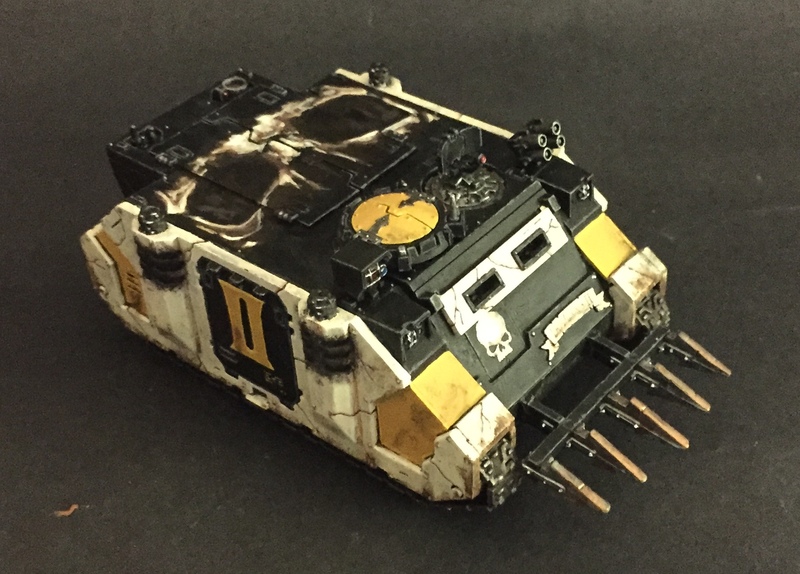 I decided that my Blood Angels needed some wheels (well, cat tracks anyway) and so I’ve put together my first Rhino transport vehicle for them. And, as it happens, I’m pretty happy with it. What’s more, I learned a couple of lessons with this one, that I shall happily share with you here. But before that, let’s talk inspiration. As you will know if you’ve been following the progress of this army, I’ve been using classic 2nd Ed Blood Angels as an inspiration for this army, and it’s no different here. 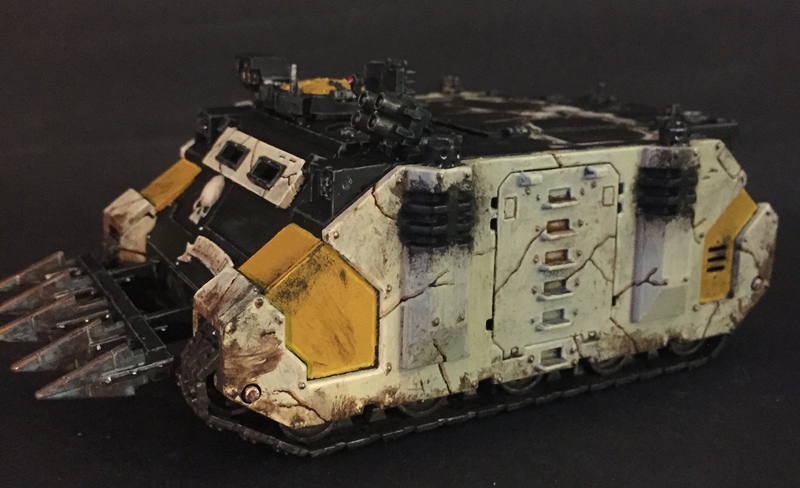 I took the classic Rhino APC from the below image and updated it a bit, and did a fair bit of weathering too. See if you can spot some similarities. Now obviously there are some differences – a lot of them really, but this was where my ideas started. The tactical arrows on the roof, the symbols on the front, the general colouring… this was in my head when the project kicked off. So first lesson to impart; read the instruction that come in the box when assembling. I’ve put together many a rhino over the years, but with this kit, things are a little different. I of course charged into it thinking ‘I know how to do this!’ and then came a cropper when I went to go and put one of the side panels. It’s a lot easier if you do it the way they tell you in the instructions. Just so you know. Second lesson; Mephiston Red spray is brilliant. A couple of thin coats of it, and you’ll have saved your brushes a lot of time. Heck, you’ll have even saved time with your airbrushes if you’re that way inclined. What’s more, with a slightly elevated angle, you get some great natural shadows in there. So glad I picked it up, and will definitely be using it again. With this kit, I used a couple of extra bits as well. The pintle mounted heavy flamer (because you can never have too many flamers) comes from the FW upgrade clam pack, and that’s some etched brass on the front piece there. As with any FW kit, there’s a lot of swearing involved in assembly, and plenty of mould lines to clean up, but of course you also get an amazing looking miniature when all of that’s done. I much prefer this kit to the one you get from GW when it comes to looks and design. I’m really happy with the weathering job here. Typhus Corrosion is a great pot of paint and appears all over this tank, but the effect I really like was required by using a couple of grey paints to give the lower parts of this vehicle a dusty look. I’ve used it on my dreadnoughts before now, and it fits in with the basing of my other minis, so it’s great for tying the army together. Now, why didn’t I do the big white Blood Drops on the doors? A, the door teeth make that a bit difficult, and B, putting white paint onto a red surface is not easy. And by that stage, I’d done enough of it, as you can see from the picture below. When I worked out that painting white onto red was difficult (which I always knew but we oft relearn this sort of lesson), it gave me a bit of idea. It would be plenty tough for the guys maintaining the armoury on a space marine ship as well. Especially if they’re constantly coming in and out of battle. Sure, the important vehicles would get perfect spray jobs, but rhinos? The workhorses? Maybe when all the paint was being retouched, it left marks, where the new paint was slightly different or applied too thinly or heavily. 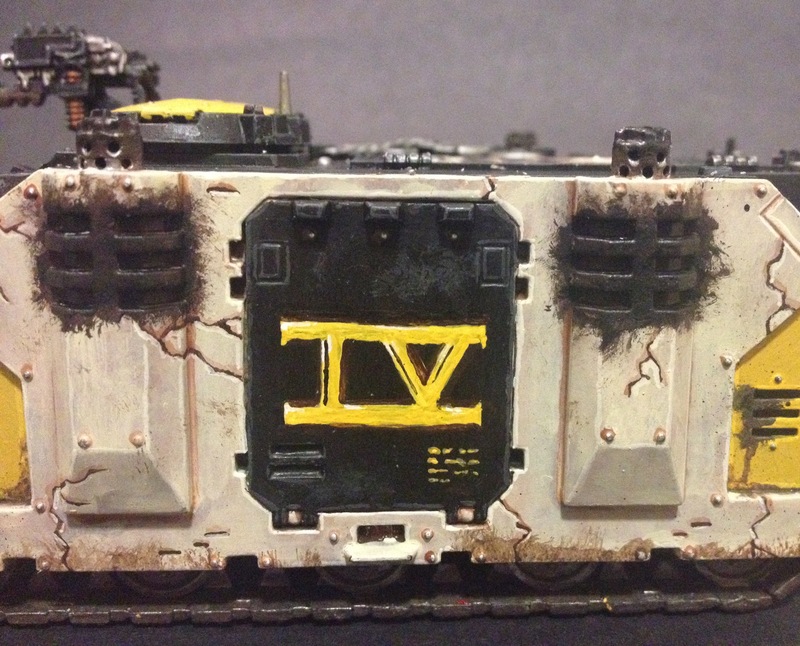 So I added this to my weathering plan and it worked really nicely I think. Breaks up the flat red surfaces a bit at least. Won’t be everyone’s cup of tea, but I like it. And so I shall leave you with the back end of a rhino to look at. Don’t fret though – you’ll have a new front end to look at soon enough. Like the titles says, this is rhino ‘1’. The next one is primed and ready for a bit of attention so I shall get to work on that soon enough. For the time being, I hope you’ve enjoyed looking at this one, and I hope your own painting projects are going well. Onwards! Last night I added the last bits of edge highlighting to the storm bolter that sits atop the turret of this tank and so I can now say that my Mortifactors Rhino is now finished. And I’m really happy with this one. 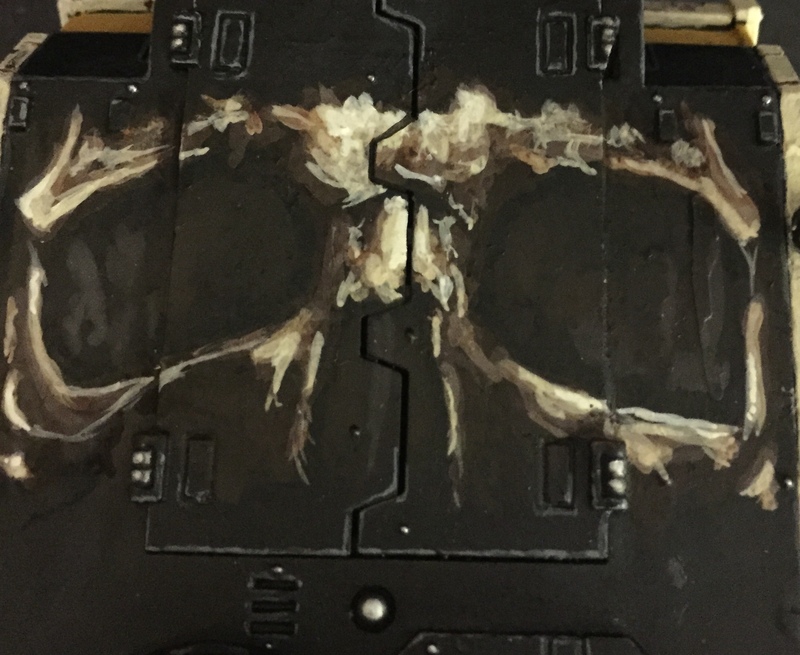 For the skull, I built up from Rhinox Hyde, through Screaming Skull to White Scar, then blended in a tiny amount of yellow, covered it all Reikland Flesh Shade to give it some warmth, and then built up again with a similar pallet. 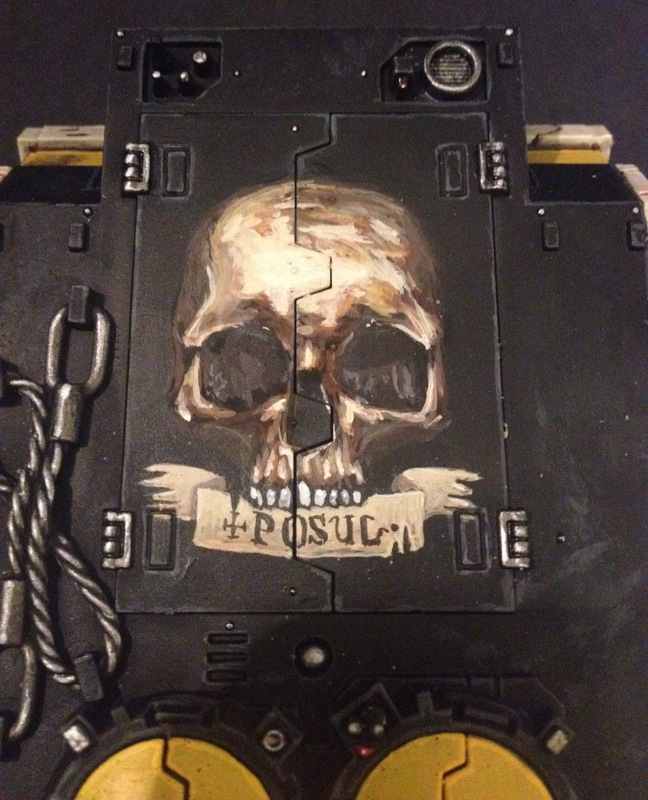 As it’s one of my personal goals to work on my freehand this year, I’m really pleased with how this came out. Though, as you’ll see below, the numeral on the side door wasn’t quite as successful – it looks a bit too human and I may revisit it later to try and ‘fix’ it. Other parts of the tank that I’m really happy with include the weathering, which is subtle and perhaps indicative of the vehicle being only recently deployed (which I’m cool with). 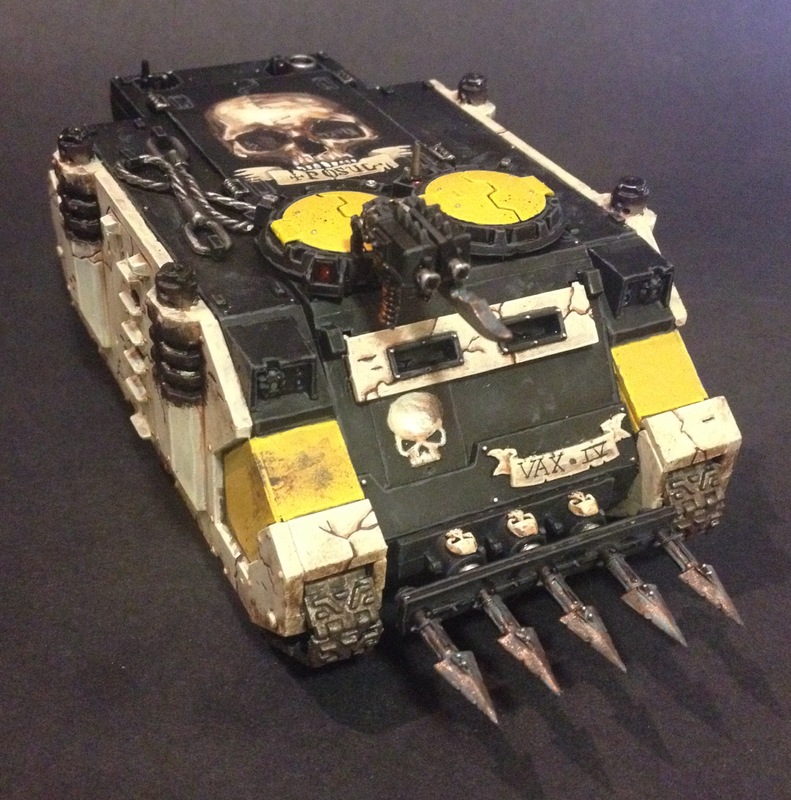 And painting this made me really enthused for this paint-scheme again. 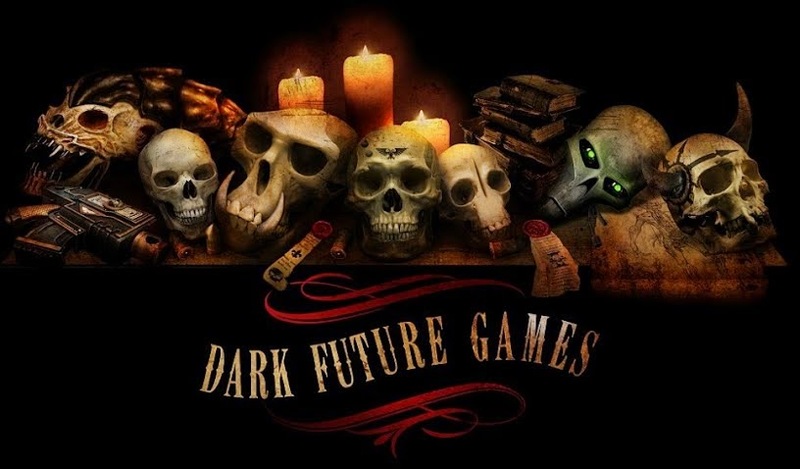 The sombre, even morbid tones of black and bone, accented with the violence of that yellow… Wow. I just reread the last couple of sentences. That sounded really gittish, right? Sorry. I sit very near a design team at work and have to listen to stuff like that all the time! Just count your blessings that I didn’t start going on about ‘stark industrial shapes’ and stuff like that. 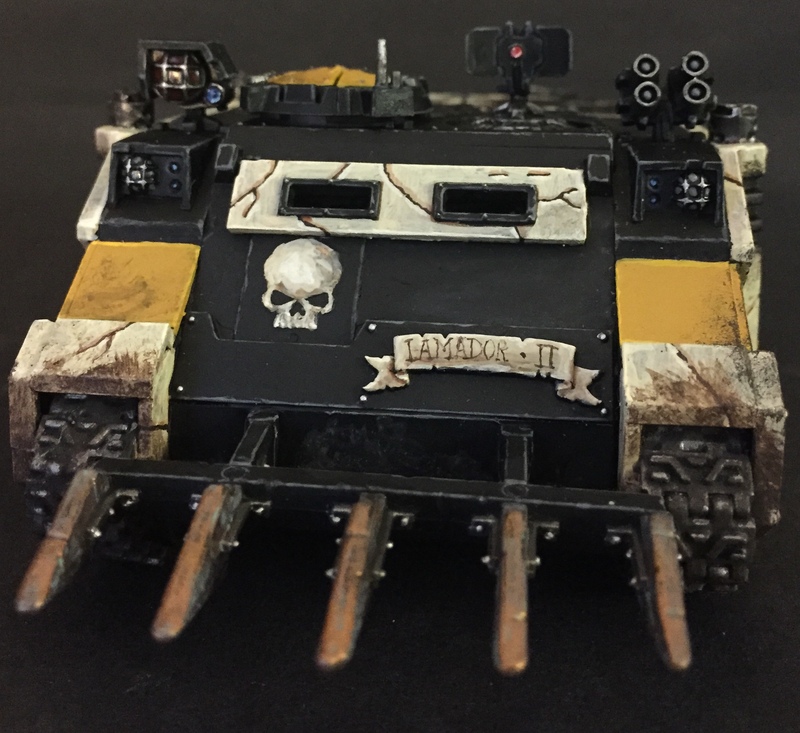 Anyway, you’ll also note the use of pieces from the Chaos Rhino kit which I used because a) it captures the borderline heretical nature of the Mortifactors chapter and b) more skulls. Anyway, here are plenty more pictures for you. I hope you enjoy them. 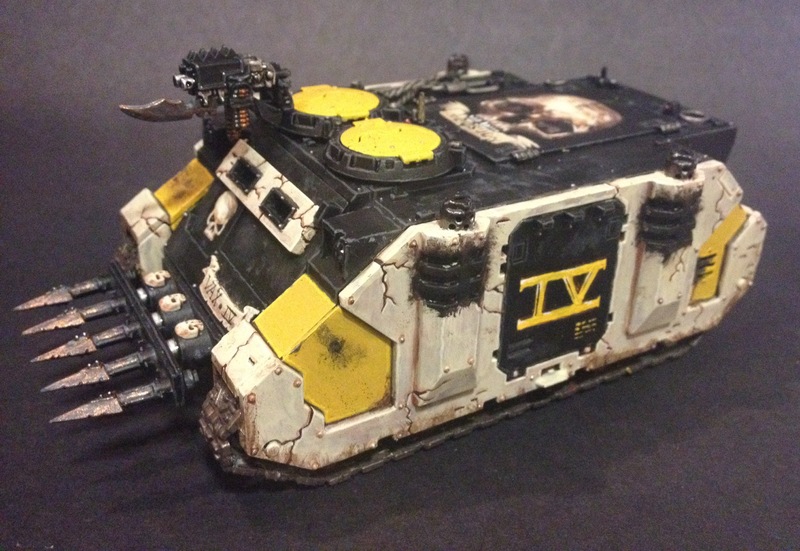 The tank was assembled and then undercoated black. It was painted using Citadel Paints using a variety of brushes. Comments? Questions? Please add them below!